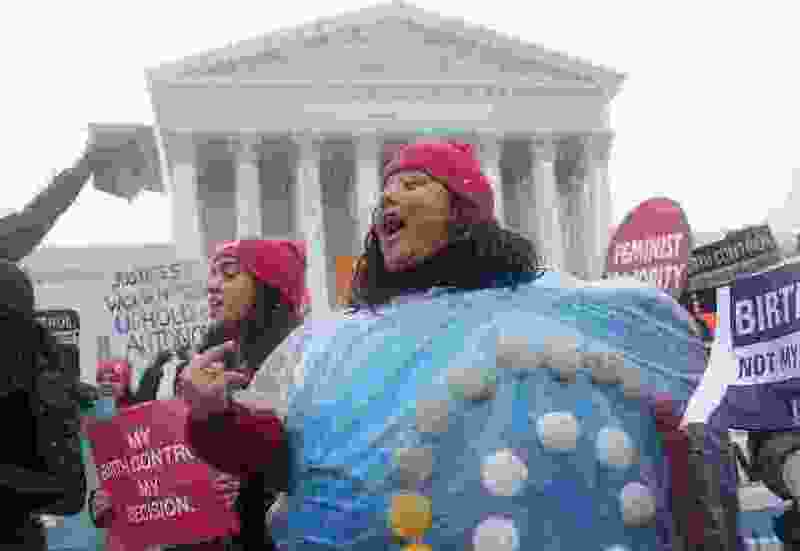 (Charles Dharapak | AP file photo) In this March 25, 2014, file photo, Margot Riphagen of New Orleans, wears a birth control pill costume as she protests in front of the Supreme Court in Washington. Millions of American women are receiving birth control at no cost to them through workplace health plans, the result of the Obama-era Affordable Care Act, which expanded access to contraception. The Trump administration sought to allow more employers to opt out because of religious or moral objections. But its plans were put on hold by two federal judges, one in Pennsylvania and the other in California, in cases that could eventually reach the Supreme Court. Access to contraception has quietly expanded over the past few months in Utah, thanks to changes in Medicaid coverage and the rollout of a new statewide reproductive health initiative. Physician Ray Ward, who doubles as a state representative, says the health care system is still riddled with coverage gaps, but it’s better than it was just a few weeks ago. As of April 1, Utah women who fall below the federal poverty level qualify to receive Medicaid coverage for contraception — even more expensive forms of birth control, such as intrauterine devices that can each cost more than $1,000. A state fiscal analysis estimated that more than 11,000 women would receive family planning services through the Medicaid expansion. Those above the poverty line can seek insurance through the health care exchanges, Ward said. And people with the most resources typically have private insurance, he added. But the new coverage for low-income women does not resolve every problem, said Jessica Sanders, a family planning research director and assistant professor at the University of Utah School of Medicine. Providers need more training on contraceptive care, and patients should be counseled on the options available to them. Sanders and her U. colleagues earlier this year launched an initiative called Family Planning Elevated to cover these gaps, paying particular attention to underserved rural communities. The group will also offer free contraception to women above the federal poverty line and push state lawmakers to move the ball forward on reproductive health, Sanders said. Social norms and personal values can complicate discussions about contraception in the conservative Utah Legislature, but she believes the case for expanding reproductive health services is compelling enough to unite lawmakers. “Utah can be a beacon of light for other conservative states,” Sanders said, “and really kind of show that this is about family values, that this is about supporting families and healthy communities." Increased contraception could also yield millions of dollars in savings by reducing maternal and birth costs, Ward estimated when sponsoring a bill to widen family planning coverage. While successful, his 2018 bill was ultimately absorbed by the further-reaching Medicaid measure that the Legislature passed this year. No prescription? No problem. New health department order will make it easier for Utah women to access birth control. There’s encouraging data from contraceptive programs in other states, Sanders said. A seven-year initiative in Iowa that offered family planning services to people up to 300 percent of the federal poverty line yielded a net savings of $96 million by averting thousands of births. A Colorado program that increased access to intrauterine devices has helped cut teen pregnancies by about one-fifth in areas near federally funded clinics that distribute the contraception. No matter a lawmaker’s political leanings, the prospect of saving money is attractive, Sanders said. Ward has estimated that extending reproductive services to 8,000 Utahns could prevent 2,000 unintended pregnancies and 680 abortions. The private sector is also looking to step into the gap. Nurx, a company that connects women with medical providers online and offers home delivery of birth control, launched its services in Utah this week. In addition to serving women who are far from their medical providers, the telemedicine and delivery service adds a layer of privacy, said Jessica Horwitz, vice president of clinical services at Nurx. Utah lawmakers this session passed a couple of measures aimed at curbing abortion in the state — one bill focused on preventing the termination of pregnancies solely because of a fetal Down syndrome diagnosis, while another sought to ban abortions after 18 weeks. Planned Parenthood, which is now suing the state to block the 18-week ban, argued during the debate over these bills that instead of restricting access to an abortion, Utah legislators should focus on providing better health services to women. Family Planning Elevated aims to reach 13,000 Utahns with no-cost contraceptive care from 2019 through 2021, according to a news release. The initiative, which received a majority of its funding through foundation grants, has a budget of about $9 million for the next few years, Sanders said. Over that time, they’ll try to persuade state officials to approve Medicaid-funded contraceptive coverage for people up to 250 percent of the federal poverty line, Sanders said. Ward has pushed forward several successful bills related to reproductive health, including one to provide birth control to women without a prescription. And he says he’d consider further expanding Medicaid for family health services but would need to study a specific proposal before making up his mind.